Volcanoes are places on the earth’s surface where molten rock, gases and pyroclastic debris erupt through the earth’s crust. 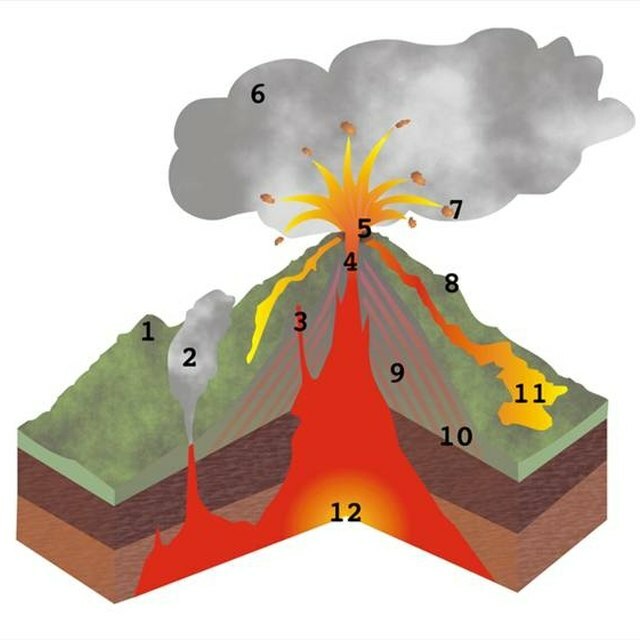 Many volcanoes are in the shapes of domes or mountains. Magma is molten rock within the earth’s crust that becomes lava when it erupts. Rock also comes from volcanoes in the form of ash, finely powdered rock that looks like dark smoke. 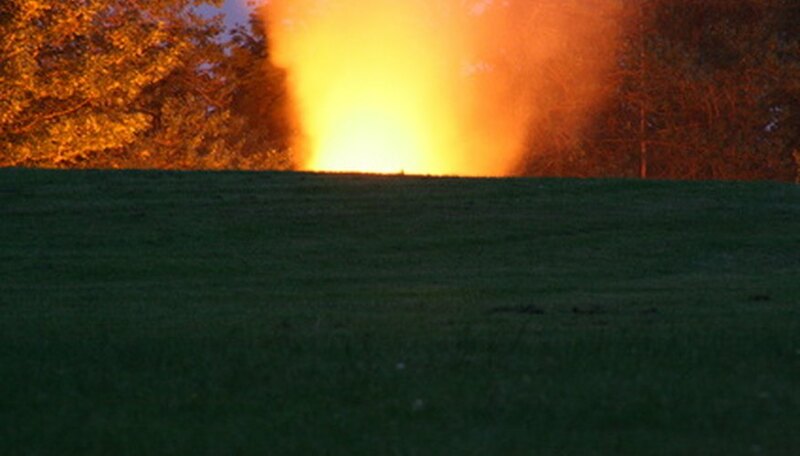 Just a few steps can help you to create your own model volcano that erupts and blows ash. Select a spot in your backyard, and lay newspapers over the work area. Place a large cookie sheet on the newspaper, and place a piece of cardboard inside of the sheet to serve as your volcano base. Then, glue the bottom of the plastic film canister to the center of the cardboard platform. Allow the glue to dry for an hour. Mix the flour and salt in a bowl and add one to two cups of water until you have a clay-like consistency. Mix the combination with your hands, making sure the mixture is moist but dry enough to cure quickly. Mold the clay mixture around the base of the plastic film canister until you get to the top of the canister. Make sure the base of your volcano is wider than the top part, which should be narrow. Allow this mixture to dry completely. Make sure the inside of the mixture is not too wet or else the weight will cause the clay to break away from the canister. Next, make lava channels and erosion gullies in the clay and paint the clay mixture brown. You also can use green paint to paint areas of trees or white paint to place snow on the top of the volcano. Place 20 ml of water in the plastic film canister, followed by half of an Alka-Seltzer tablet. Then, quickly and firmly put the canister lid back on, and place one tsp. of real volcanic ash or cornstarch powder on top of the lid. Watch the lid bulge and then blow off violently. You will see the volcanic ash blow everywhere. King, YaShekia. "School Project: How to Make a Volcano That Blows Ash." Sciencing, https://sciencing.com/school-make-volcano-blows-ash-6303116.html. 24 April 2017.